Lucky Stars Classic Slot Machine - Casino Answers! Lucky Stars is a 3-reel, 5-line classic slot machine developed by Slotland Entertainment, featuring a hold feature, multipliers, bonus spins and a progressive jackpot. You can play the Lucky Stars classic slot machine at Slotland Casino. Bets on the Lucky Stars slot machine are $0.50, $1 and $2. You can select 1-5 paylines. Unlike most other slot machines, you can place individual bets on different paylines. If you wish, you can bet $2 on line 1, nothing on line 2, $0.50 on line 3, $1 on line 4 and another $2 on line 5. You could also simply only bet on line 5 if you want. You can bet anywhere from $0.50 up to $10 per spin on the Lucky Stars casino game. This is a low betting range that would mostly be suited towards low rollers or casual players. To play the Lucky Stars slot machine, select your bet with the radio buttons below the slot machine and pull the lever in the top-right. The Lucky Stars online slot is linked to the Slotland Casino Progressive Jackpot. The Slotland jackpot is currently at nearly $60,000 and increasing at a rapid pace. To win the Lucky Stars progressive jackpot, you must bet $2 on a line that 3 Bar symbols land on. If you bet less than $2, you will instead win 1000X your bet. You can play for the Lucky Stars progressive jackpot when you sign up at Slotland Casino! Lucky Stars has a hold feature that is typically found on British fruit machines. The hold feature is triggered randomly on the Lucky Stars online slot game. When this hold feature is triggered, you can hold any or all of the three reels by checking the boxes below the reels. Hold the more valuable symbols to increase the odds of a big win on the Lucky Stars online slot! Three Star medals are located at the right side of the Lucky Stars slot machine. When three or more Star symbols appear on the reels on Lucky Stars (on active paylines), one of the Star medals will become highlighted. When all three Star medals are highlighted, you will win a bonus spin at a 10X multiplier! When this bonus spin is triggered, your bet from the previous spin will become locked. Your winnings for the spin will be multiplied by 10X. Casino Answers recommends that when two of the Star medals are lit up, you should always play the maximum bet to maximize your potential bonus spin winnings. The Lucky Stars classic slot may be a little bit antiquated by what we expect today as far as slot machine presentation, but it’s still worth some spins. It has a fruit machine hold feature, bonus spins and it’s linked to the progressive jackpot. Count your lucky stars and hopefully you can take home a monsterous progressive jackpot when you’re playing at Slotland Casino! Do USA players have access to the Lucky Stars online slot game? Absolutely. American players are welcome to play the Lucky Stars slot machine at Slotland Casino. Can I play the Lucky Stars slot machine on my mobile phone? 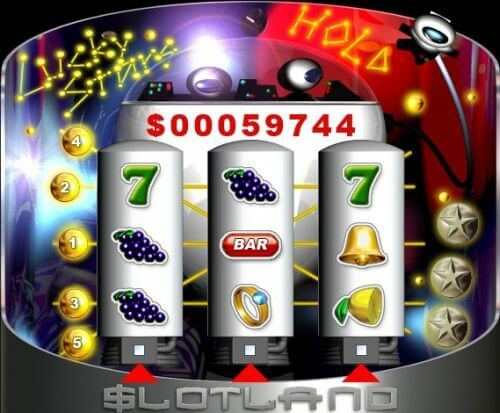 Yes, you can play Lucky Stars along with several other Slotland games on your cell phone or other mobile device. Installation instructions and other details are available at Slotland Casino. How do I win the Lucky Stars progressive jackpot? 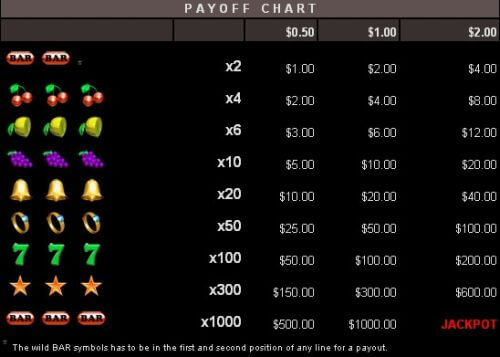 You can win the Lucky Stars progressive jackpot by landing 3 Bar symbols on a payline on which you are betting $2. Do I need to download any casino software to play the Lucky Stars slot game? No, the Lucky Stars online slot can only played from within your web browser. It can only be played for real money. Where can I play more space-themed slot machines? You can find more space and sci-fi slot games by reading our list of sci-fi slot machines.